Today the journal?Science?published the highest quality genome sequence produced to date for the bread wheat variety Chinese Spring. This was long considered an almost impossible task—the wheat genome is five times larger than the human genome and more complex—but also a critically important one in an era of climate change. Wheat is the world’s most widely cultivated crop, accounting for 20 per cent of all calories consumed throughout the world.? For the past 13 years, more than 200 scientists from 73 research institutions in 20 countries have been endeavouring, through the International Wheat Genome Sequencing Consortium (IWGSC), to complete?the genome sequence for bread wheat and make publicly available the new genomic assembly for breeders seeking to develop improved varieties. ? “Essentially we have completed the wheat genome jigsaw puzzle with all the pieces put together in their correct positions and order, providing an enormous advantage for breeders when searching for genes that control important traits in the crop,” said Pozniak. “This breakthrough research will help produce better wheat varieties over the long term.”? 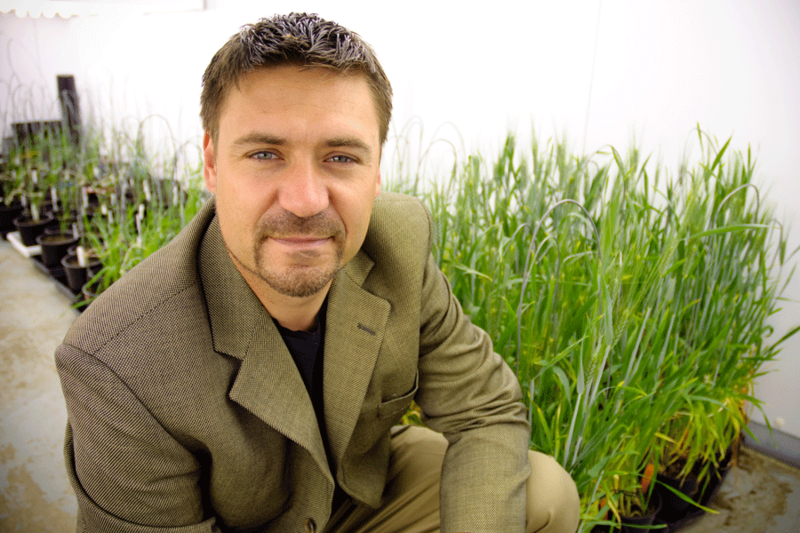 Pozniak leads Canada’s contribution to the IWGSC-led wheat genome initiative through the Canadian Triticum Applied Genomics (CTAG2) project, which also includes scientists from the National Research Council, Agriculture and Agri-Food Canada (AAFC), the University of Guelph, and the University of Regina.? “The new genome assembly provides a chromosome-by-chromosome representation rather than the fractured picture available previously and will elevate wheat research and breeding to a level equal to, or even better than, other major crops,” said Andrew Sharpe, director of Genomics and Bioinformatics at the U of S Global Institute for Food Security (GIFS) and co-lead for the CTAG2 project.? - "This breakthrough research will help produce better wheat varieties over the long term." With the world’s population expected to reach 9.6 billion by 2050, Maurice Moloney, executive-director of GIFS at the U of S, said this discovery will have a major impact on global food security.? “With the support of the University of Saskatchewan and its Global Institute for Food Security, NRGene delivered the assembly of the whole genome from start to finish in just three months, a remarkable computational feat given the complexity of the wheat genome,” said NRGene CEO Gil Ronen.? The?Science?article is entitled?Shifting the limits in wheat research and breeding using a fully annotated reference genome?and can be read?คาสิโนออนไลน์ แจกเครดิตฟรีhere. The U of S-led team also contributed to a second related?Science?article led by the U.K.-based John Innes Centre and published Aug. 16th entitled?The transcriptional landscape of polyploid wheat?that describes the repertoire of expressed genes in the new wheat genome sequence?and can be read?here. The next step for the U of S team will be to initiate a larger-scale international initiative to sequence the more than 10 cultivated wheat varieties from the main growing areas across the globe. The 10+ Wheat Genomes Project, started last year and led by Pozniak, is using the same NRGene technology to sequence the genomes. Sequencing for several varieties is already complete. More information can be found at:?www.10wheatgenomes.com.